ESP Disk, with the recent new additions to their roster, seem intent on preserving the ideals that informed much of their original catalogue. By giving the likes of Talibam! and The Naked Future a platform to release material, ESP seem to be drawing parallels between contemporary musics which are similarly as singular and wilful as those classic sides, whilst also acknowledging the influence that initial run of releases has exerted over subsequent generations. 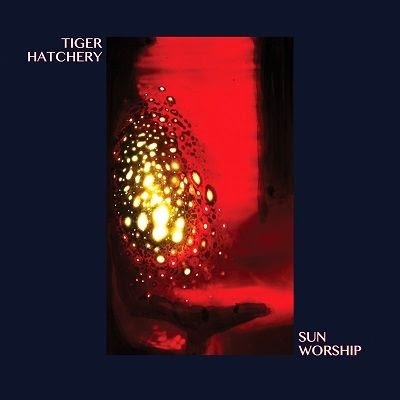 Chicago's Tiger Hatchery are the latest such group to be given the ESP seal of approval, this release having slipped out in the final weeks of 2013. Whilst they've issued a slew of cassette tapes, a cd-r, a single sided 12" and a couple of split 7"s (including one with Wasteland Jazz Unit - the most harrowing 'jazz' experience this side of Borbetomagus), both self-released & on countless independent labels, Sun Worship is Tiger Hatchery's first widely available title. Formed when Mike Forbes (saxophone) met Andrew Scott Young (bass) in Denton, TX, upon transplanting to Chicago the pair met Ben Billington (drums) and the band began to cut their teeth amongst the experimental and noise underbelly of Chicago's more outré DIY scene (they were regulars and residents at The Mopery). Its fitting that the energy & grit of that grounding informs much of the jagged sonance that permeates this record. The sound they create tips a cap to the ecstatic power of the free jazz ESP championed first time around, the driven angular dissonance found on the likes of Amphetamine Reptile's catalogue, as well as the abrasive possibilities found in harsh noise. Thats not to say that this record is an acerbic impermeable wall. In fact Tiger Hatchery, whilst always retaining a barbed edge, do quiet & subtle to dramatic effect, which serves to reinforce both the sheer musicality of their approach, and brings the overt power of their most intense moments into sharper focus. And what power. At times its easy to forget that so much can be generated by just three men. Post-Ascension or Machine Gun levels of intensity are common place but without ever resorting to posturing and needless blowtorching power plays. For every caustic burn there is a lyrical navigation in the approach, or soothing balm to help reduce the inflammation. Sun Worship is at once visceral and deft, hailing from the Fire Music lineage without ever being tied to it or restricted by its historically recognised parameters. Its the sound of three men as conversant in the free noise of American Tapes or Japan's Alchemy Records, as they are the extremes of the Impulse or FMP's catalogue. A singular, wilful, brutally/beautifully realised release, that deservedly sits side-by-side with those fore bearers in the hallowed halls of ESP Disk, with whom they are ideologically and sonically aligned. This seems to be a great album. The Amphetamine Reptile link made me check out old Am Rep stuff (what a great label). Tiger Hatchery also remind me of the high intensity stuff John Zorn does with Painkiller, for example. A band we should have on the radar.